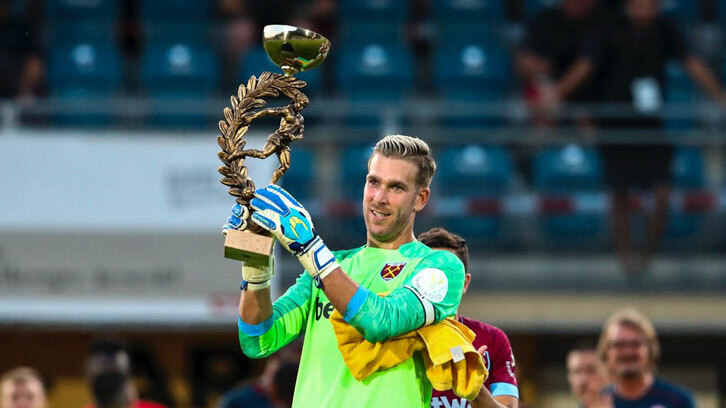 Manuel Pellegrini lifted his first trophy as a Hammers boss – humble though the Betway Cup may be – and was more than happy with his team’s performance. He told www.whufc.com after the game: “I was very happy with our performance. It was better if you compare that with the last game we played before we came to Austria [against Ipswich Town]. “We drew 1-1 but I think we always had good build-up, recovered the ball well and pressed well and this is a Mainz team who try to have possession and we had more possession than them, so in a tactical way we improved a lot compared with the last game. With one more game ahead of the Liverpool game on August 12 the boss knows there much more required and said: “We need to keep improving. We have ten days more work before we start the Premier League and there are a lot of players who are not 100 per cent. “Tonight we played without Javier Hernandez, without Felipe Anderson, without Andriy Yarmolenko, without Cresswell, but these players are working more every day and they will be nearer to their normal performance. We need to work very hard these ten days. “We will try, if we don’t take any risks, Felipe can play some minutes in the game we are going to play on Friday, but maybe it will be more difficult for Andriy to play. The manager admitted there could be further movement, both in and out of London Stadium, over the next ten days. “It depends which players will not continue in the club and also on the options we have to replace them, so the sporting director and myself as manager have to work very hard to be absolutely sure that we have the squad that we need for the Premier League. I thought the back 5 played very well, Diop looks more comfortable on the left side. I also thought the front 3 did fine, I am a huge fan of Antonio and Arnie. I feel our problem is in the middle of the park. In the first half none of our midfielders got forward. We need a 10 who can come look for a ball but still get back into his defensive role. The biggest thing I have noticed is that we have no 10 in the current team and this means we cannot get players up to support the front 3. It will be interesting to see what the next 10 days brings. Glad we finally won the sponsors Cup hopefully a good omen !! !